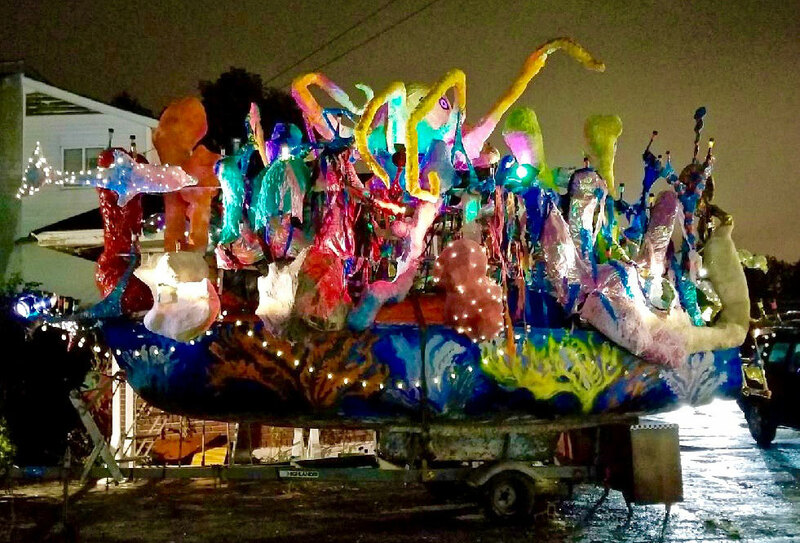 The floating artwork, “Create Coral Reef,” aims to increase public awareness and promote individual and government action to save the coral reefs worldwide. It was commissioned as part of Fort Point Arts Community’s 39th Fall Open Studios from Oct. 12 to 14. Beck plans a related performance on the Congress Street bridge, near the Tea Party boat, from 2 to 3 p.m. Sunday, Sept. 14. 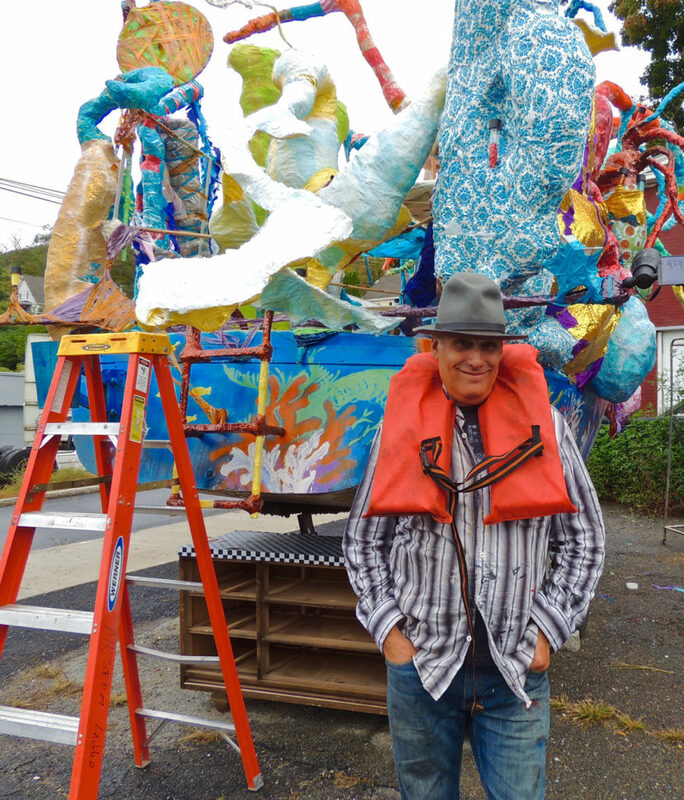 Since the early 1980s, Beck has been organizing community projects that have filled vacant lots and city parks around Boston and later Lowell with visionary, carnivalesque art under the banner of his Revolving Museum. The museum began as an occasional, nomadic enterprise, but became an actual place when it occupied a building in Boston’s Fort Point neighborhood in the 1990s and moved to Lowell in the 2000s. But Beck left his museum in 2009—some would argue he was pushed out—and it closed due to a lack of funds in 2012. Beck served as the marketing and community engagement director for the Fitchburg Art Museum from 2011 to ’13 and spent half a year as economic development director for the city of Fitchburg. Then as the board wound down the Revolving Museum, they offered the nonprofit back to him, and he launched it again. His most recent Revolving Museum escapade was an attempt to build the world’s largest paper airplane. Hundreds of volunteers helped assemble it. In June, a crane hoisted the aircraft—64-feet and 6-inches long of corrugated cardboard papered with artworks—several feet up into the breeze at Fitchburg Municipal Airport. “Create Coral Reef” is a side project of a bigger project in which Beck aims to create a 60-foot-wide sculpture of a manta ray and sink it beneath the waters off Florida to serve as the foundation for growing coral. 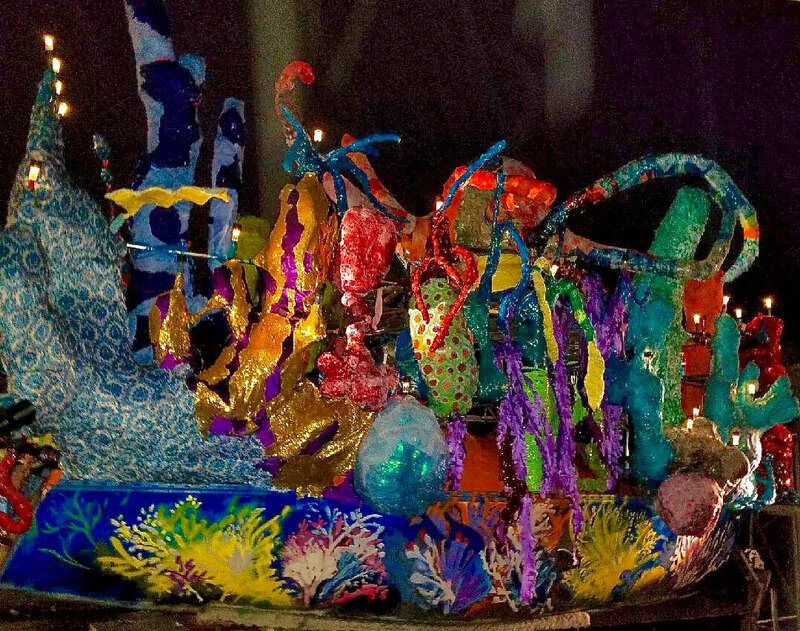 Coral has been on his mind, inspired in part by his wife’s name—Coraly Rivera—and partly by news reports of the massive die-off of coral around the world. For the Fort Point commission, Beck went looking for a boat and bumped into Cliff Clark, an editor at the Fitchburg Sentinel & Enterprise newspaper, who by chance was mulling parting with his 22-foot-long sailboat. Beck convinced him to donate the boat and trailer to the cause. Florida friends donated aluminum that was sculpted over the cabin. 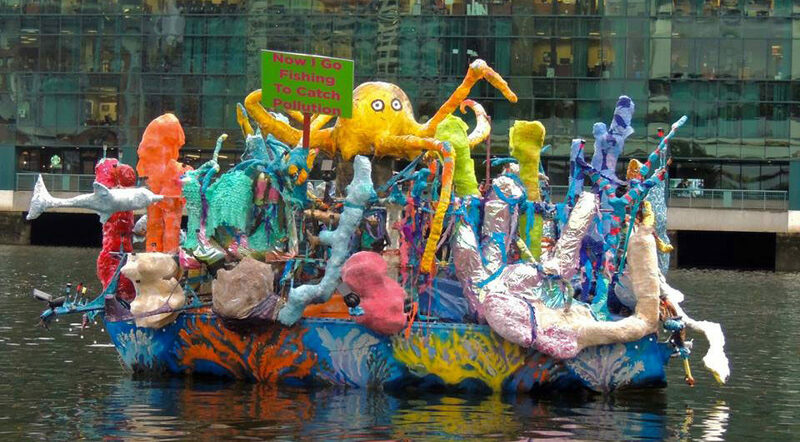 Beck and his collaborators turned the tape and recycled materials into an encrustation of coral tubes and tentacles in shades or yellow, blue, red and green. Solar-powered LED lights illuminate it at night. The sculptures rise some 14 feet above the waterline. “We have to go at low tide to go under the bridges,” Beck says.